One team, three conference players of the year, and the no. 3 scoring offense in the country. The front line for the 2016 women’s soccer squad featured three WCC Players of the Year: (from left) Nadia Gomes, Ashley Hatch, and Michele Vasconcelos. Photo by Bradley Slade. A soccer team is often known for its star forward (Messi, anyone?). 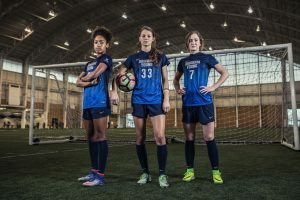 BYU’s women’s soccer team is known for three. Ashley M. Hatch (’17), Michele Murphy Vasconcelos (’17), and Nadia F. Gomes (’18) made up BYU’s starting forward line—and anchored the no. 3 scoring offense in the NCAA. What’s more: Vasconcelos is the 2016 WCC Player of the Year. Gomes won the honor in 2015, Hatch in 2014. The NCAA charts back her up. All three forwards closed the season in the top five of an NCAA stat, among them Vasconcelos at no. 3 and Gomes at no. 4 in assists, and Hatch at no. 3 in goals. Actually, for seven weeks, Hatch led the nation in goals (two “Hat-ch tricks” helped). She lost the no. 1–scorer crown during a weeklong hiatus from college soccer—when she got called up to play for the U.S. Women’s National Team. “Being the no. 1 scorer was awesome, but I wouldn’t trade that week for anything,” says Hatch, the third Cougar in program history to play with Team USA. She joined the national-team camp and played in a friendly match against Switzerland. While Hatch put away an impressive 19 goals this season, Vasconcelos chipped in another 16, Gomes 6. The team, in fact, nearly doubled last season’s goals, outscoring opponents 58 to 11. Repetitious drills made the players confident in the box, says Rockwood, and a special team chemistry helped too. “Everyone wanted the success of their teammates,” Vasconcelos elaborates. “You stepped on the field and you knew you had 28 people backing you up.” And for the forwards, that unleashed run-your-guts-out play. “I want to make a sprint down the line, because I know one or two people are in the box to finish it for me,” says Hatch. They attacked as a unit. The best kind of goal, adds Gomes: the ones where all three forwards touched the ball before it went in. During BYU’s Sweet Sixteen NCAA tournament game, ESPN commentators couldn’t stop talking about the speed of BYU’s forward line. Unfortunate tournament seeding pitted no. 4–ranked BYU against no. 3 South Carolina—a matchup of top teams that usually doesn’t happen until the Final Four. BYU lost 0–1 on a penalty kick. Seniors Hatch and Vasconcelos look forward to entering the National Women’s Soccer League draft. Gomes, a junior, still has a year to leave her mark. The hottest ticket in Provo in 2012 was to BYU women’s soccer hosting their own elite eight match. At the ripe old age of 19, BYU’s Aleisha Cramer is playing with Team USA’s Mia Hamm and Brandi Chastain.